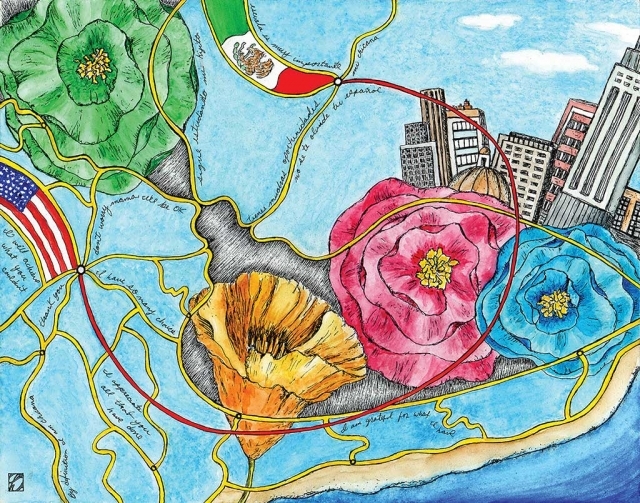 “One Path to Many Roads” by Silvia Huerta, pen, ink and watercolor on board, 14 x 11 inches, Collection of the artist. “Alegria” by L.T. Bunning, charcoal on paper, 24 x 20 inches, Collection of the artist. SANTA PAULA, CA - The annual De Colores Art Show returns to the Santa Paula Art Museum with a premiere reception on Saturday, October 22, 2016, from 2:00 p.m. to 5:00 p.m. The group exhibition features art by 30 contemporary artists whose vibrant works are inspired by Latino culture. The premiere party will include live music by Paraguayan harpist Ignacio Lopez and Trio Príncipes. Admission to the event is $4.00 for adults, $3.00 for seniors, and is free for students and museum members. With the De Colores Art Show now in its 23rd year, longtime curator and featured artist Xavier Montes is excited to showcase new perspectives. “This year’s show is about envisioning and working together toward a better future,” says Montes. “It’s about acknowledging the struggles and achievements of the previous generation and empowering young people to embrace their diversity and pursue their passions.” The artworks on display come in a variety of styles and media, and tell meaningful stories of hope, heritage, strength, and peace. The exhibition features art by Richard Arenas, Jackie Bermudez, Joe Bravo, L.T. Bunning, Ray Cirerol, Lynn Coleman, Pedro de la Cruz, Beverly Cunningham, Roy Grillo, Dolores Gonzalez Haro, Sergio Hernandez, Gina Herrera, Silvia Huerta, Carolyn Jorgensen, Beverly Lazor, Renate Lichter, Maria Lopez, Rhonda Magnus, Mike Molina, Xavier Montes, Rick Ortega, Betty Saunders, Christina Ramos, Sylvia Raz, John Robertson, Mark Tovar, Veronica Valadez, and Doreen Villanueva. The show is made possible through the generosity of its sponsors which include Calavo, Clinicas del Camino Real, La Cabana, and Santa Paula Latino Town Hall. The 23rd De Colores Art Show runs through January 29, 2017. The Santa Paula Art Museum, Jeanette Cole Art Center is located at 117 North Tenth Street in beautiful downtown Santa Paula. The Museum features rotating exhibitions of vintage and contemporary art, educational programming for children and adults, artist talks and demonstrations, a gift shop, and more. The Museum’s regular hours are Wednesday through Saturday from 10:00 a.m. to 4:00 p.m., and Sundays from 12:00 to 4:00 p.m. Regular admission is $4.00 for adults, $3.00 for seniors, and free for museum members and students. For more information, please contact the Museum at (805) 525-5554 or info@santapaulaartmuseum.org. Revamped ensembles and a new conductor will make their debut at California Lutheran University’s annual Founders Day Concert. The concert will begin 7:30 p.m. Friday, Oct. 28, in Samuelson Chapel on the Thousand Oaks campus. The 20-member University String Symphony, which includes members of the former University Symphony, will perform selections from “Capriol Suite” by Peter Warlock, Theme and Variations by Aleksandr Glazunov and Mozart’s Divertimento for Strings in F major under the direction of Yoshika Masuda. The accomplished musician also began giving cello lessons at Cal Lutheran this fall. The University Wind Ensemble will close the concert with an eclectic mix of traditional favorites and exciting contemporary works. The ensemble became an all-student group this fall. It continues under the direction of assistant professor of music Michael Hart, the director of bands at Cal Lutheran. Masuda has performed as a cellist at the Solitär at the Mozarteum in Salzburg, the Sydney Opera House, the Dai-ichi Seimei Hall in Tokyo and the Walt Disney Concert Hall in Los Angeles. A keen advocate of contemporary music, he presented the world premieres of works by Michael Cutting, Xander Rodzinski and Bent Sørensen. 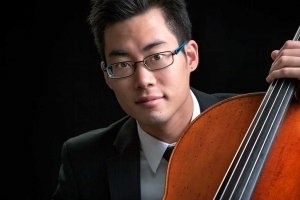 The cellist took first place in the 40th Midland-Odessa National Young Artist Competition in Texas, the 25th Australian Concerto & Vocal Competition and the 11th All-Japan Viva Hall Cello Competition. He received the prestigious Yamaha Music Foundation of Europe String Award in 2010. Born in Kobe, Japan, Masuda moved to Australia after the 1995 earthquake destroyed his family’s house. He began playing the cello at the age of 5 and studied at the Sydney Conservatorium of Music. He earned a bachelor’s degree in music with first-class honors and a master’s degree in music with distinction from the Royal Northern College of Music in England. He holds a doctorate in musical arts from the University of Southern California Thornton School of Music, where he studied with the legendary cellist Ralph Kirshbaum. The chapel is located at 165 Chapel Lane. Additional parking is available in the lots at the corner of Olsen Road and Mountclef Boulevard. Oxnard, CA - Bridge Carney, PT boat historian and model maker, will be the featured guest at the next Channel Islands Maritime Museum Speaker Series, 6:30-7:30 p.m., Oct. 20, at the Channel Islands Maritime Museum, 3900 Bluefin Circle, Oxnard. Carney will share his experience with the ELCO PT boat and its missions in the Pacific, as well as discuss the PT 157, its crew, and its assignments in the Solomon Islands, including some of the more notable and harrowing missions in the South Pacific during the summer of 1943. These missions include the 157’s skillfully executed rescue in contested waters of the PT 109 crew and its skipper, Lt. John F. Kennedy, who would go on to become the 35th President of the United States. Carney’s two books on the subject, written in collaboration with the original skipper and torpedo man of the PT 157, also cover the making of his highly accurate and detailed PT 157 model, which will be on display at the presentation. The Speaker Series is a lecture series held every third Thursday at the Channel Islands Maritime Museum. Refreshments are served at 6.30 p.m. and the lecture begins at 7.00 p.m. 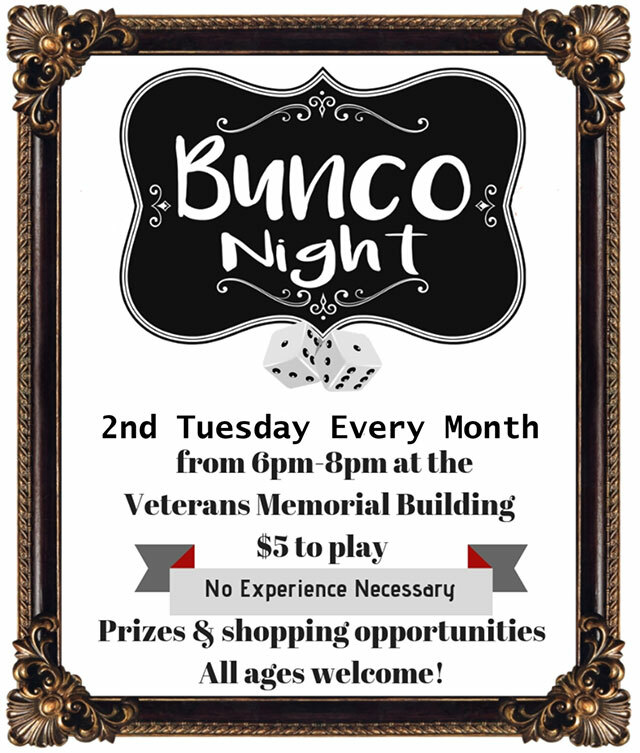 Entry is free with membership, $5 for non-members, $4 for seniors. For more information, visit www.cimmvc.org or call (805) 984-6260. The Santa Paula Concert Series presents a classical concert, Dvořàk Meets Shostakovich on Saturday, November 5 at 7:00 PM at the historic Universalist Unitarian Church, a Ventura Historical County landmark, located at 740 East Main Street, Santa Paula. This performance presents the String Quartet No. 3 of Dmitry Shostakovich and the String Quartet No. 12, Op.96 of Antonin Dvořàk. The Sincopa String Quartet was established in 2015, and had its debut concert in May 2016 in Ojai, California. The members of the quartet come from different countries, and each of them brings influences from different cultures. Now all living in the L.A. area, they have come together because they share the same passion for chamber music. Violinist Ashot was a member of the prestigious Vardanyan Quartet in Armenia. Violinist Luis-Gustavo Mascero Alberto hails from Brazil and had studied and performed both classical and jazz performance. Violist Jennifer Wu has performed from Carnegie Hall to Walt Disney Hall, as well as internationally. Cellist Wonsun Keem has been a member of the Gyung-gi Philharmonic and Bach Solisten Seoul Ensemble. All four members freelance throughout Southern California. 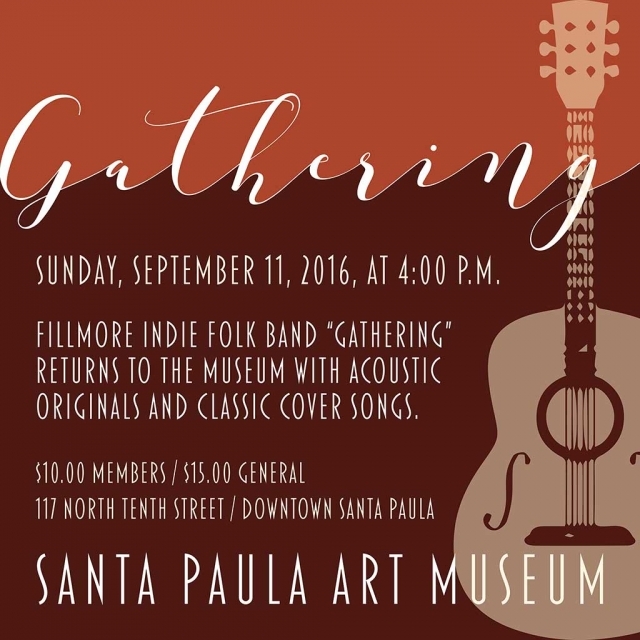 The Universalist Unitarian Church of Santa Paula has been home to a number of musical events throughout its 127 year history. Admission is $20 donation at the door, from the church office during office hours, or by Paypal on the church’s website: www.uucsp.org. Credit cards, checks and cash are accepted at the door. Children 12 and under are $10; children 5 and under are free. Proceeds benefit the Universalist Unitarian Church of Santa Paula Building and Historical Fund. UUCSP is a registered Ventura County Historical Landmark. For more information, call 805-525-4647 or email uuscpoffice@gmail.com. Parking is available on the street or behind the church. A Thousand Oaks native who has returned to his hometown to teach music at California Lutheran University will present his first faculty recital on Saturday, Oct. 22. Joseph Peeples will perform a concert of organ music at 7:30 p.m. in Samuelson Chapel on the Thousand Oaks campus. The concert celebrates the 25th anniversary of the Borg Petersen Memorial Organ’s dedication. To mark the occasion, Peeples will play a dramatic piece featured in the inaugural concert, Chorale No. 2 in B Minor by César Franck. Peeples will also present a variety of compositions for organ featuring music by William Bolcom, J.S. Bach, Girolamo Frescobaldi, Felix Mendelssohn, Josef Rheinberger and Louis Vierne. Growing up in Thousand Oaks, Peeples studied piano with nationally honored teacher Ed Francis and earned a bachelor’s degree from California State University, Channel Islands. 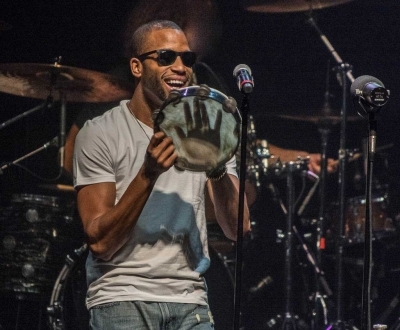 He left home to earn a master’s degree in music from Brigham Young University and a doctorate from the Indiana University Jacobs School of Music. He taught a variety of music courses at both universities and continues to serve on the faculty of the annual Brigham Young University Organ Workshop in Provo, Utah. 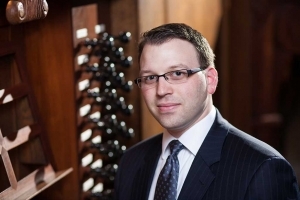 Peeples was a finalist in the 2014 Arthur Poister Scholarship Competition in Organ Playing. He recently performed during the L’Organo Recital Series of Charleston’s annual Piccolo Spoleto Festival. A church musician for 20 years, he currently serves as a substitute organist for churches throughout the Los Angeles area. At Cal Lutheran, the adjunct professor teaches applied organ and courses in music appreciation and keyboard harmony. He also teaches at Pepperdine University. The Borg Petersen Memorial Organ was dedicated in October 1991. Created with the chapel in mind, the 2,109-pipe organ took almost a year to construct. Artisans crafted it from white oak to blend with the chapel furnishings. Huge zinc and copper pipes soar 26 feet vertically, and three tiers of brass Spanish trumpets jut horizontally from the pipes. The console is made of walnut burl with cherry and maple wood stops. The pedals and the keys, both naturals and sharps, are made of rosewood. The chapel is located at 165 Chapel Lane. For more information, call the Music Department at 805-493-3306 or visit CalLutheran.edu/music. Ventura College presents a Chicano Art Exhibit, “The Imagery of Chicano: a Perspective of Chicanismo in Contemporary Art” Sept. 26 - Nov. 17 at the Ventura College Santa Paula site, 957 Faulkner Road, Santa Paula. 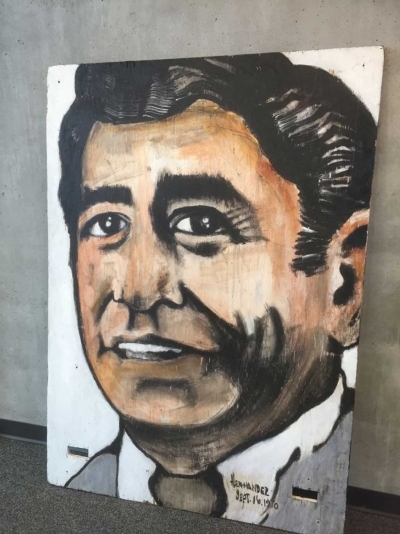 The artwork on display comes from the private collection of Ventura College history professor Tomás Sanchez. An art reception will be held 6-8 p.m., Oct. 13, with an introduction to Chicano Art by Sanchez at 6:30. Hors d’oeuvres will be served at the art reception. Parking is free. Sanchez will discuss the origins of Chicano Art and the various genre and symbolism found in this art form. Sanchez has been a serious Chicano Art collector since the mid-1980s. 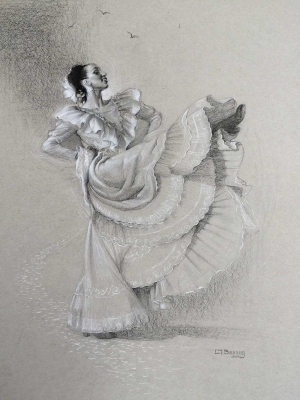 Featured artists in his collection and this exhibit include Carlos Almaraz, Roberto Tito Delgado, Elsa Flores, Salomón Huerta, Leo Limón, Roberto Gil de Montes, Frank Romero and Patssi Valdez. At Ventura College Santa Paula, Sanchez teaches World History, Western Civilization History, United States History and Chicano History. VC Santa Paula Gallery hours are Monday-Thursday, 8 a.m. - 8:30 p.m. For more information, call (805) 525-7136, or visit our Facebook page, www.facebook.com/vcsantapaula. 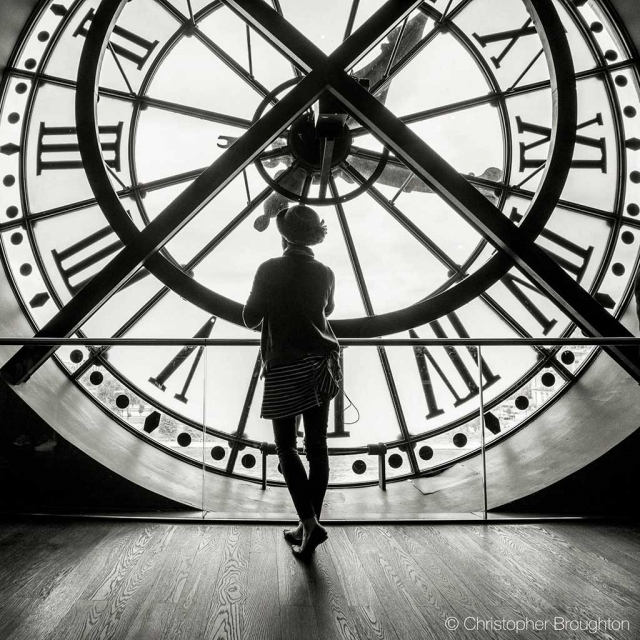 The Ojai Photography Club will host a presentation by photographer and master teacher Christopher Broughton on October 18, 2016, at 7:00 p.m. in Help of Ojai’s Kent Hall, 111 West Santa Ana Street, Ojai, CA. 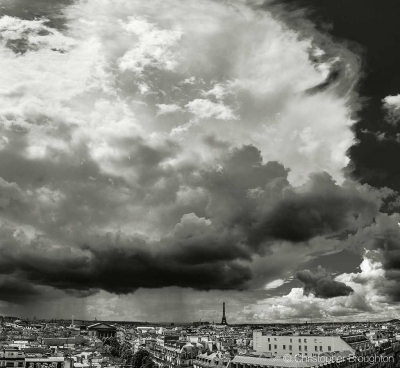 Broughton’s theme, “Practicing Seeing,” is based on his experiences in Paris over the past five summers teaching a ten-week study abroad program in photography to Brooks Institute students. 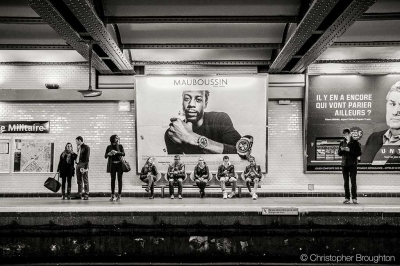 Inspired by great Parisian photographers such as Henri Cartier-Bresson and Robert Doisneau, he was quickly drawn to the allure of street scenes in the City of Light. Street photography offers unique opportunities for honing your craft, Broughton discovered. 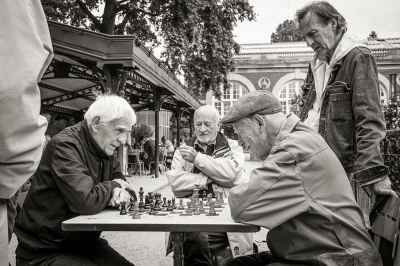 He calls it “a master’s course in anticipation, prediction, speed and your skill to capture the moment,” and elaborates: “Shooting on the street is possible anywhere. You don’t have to go on a trip because you are already there. It keeps you looking. 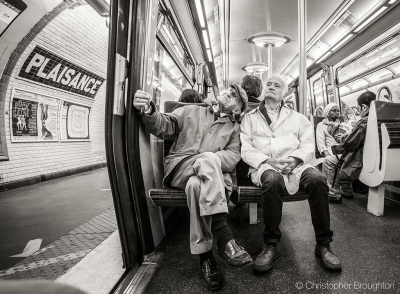 It allows you to practice seeing anytime.” The presentation will be richly illustrated with photographs taken on the streets of Paris and also in the studios of artists living there. 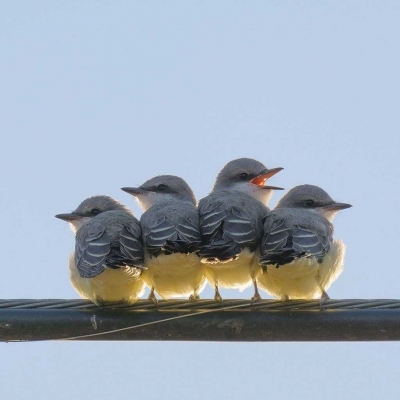 Monthly free presentations are part of the Ojai Photography Club’s community service outreach. Visitors are always welcome to attend. The annual De Colores Art Show returns to the Santa Paula Art Museum with a premiere reception on Saturday, October 22, 2016, from 2:00 p.m. to 5:00 p.m. The group exhibition features art by 30 contemporary artists whose vibrant works are inspired by Latino culture. The premiere party will include live music by Paraguayan harpist Ignacio Lopez and Trio Príncipes. Admission to the event is $4.00 for adults, $3.00 for seniors, and is free for students and museum members. The exhibition features art by Richard Arenas, Jackie Bermudez, Joe Bravo, L.T. Bunning, Ray Cirerol, Lynn Coleman, Pedro de la Cruz, Beverly Cunningham, Roy Grillo, Dolores Gonzalez Haro, Sergio Hernandez, Gina Herrera, Silvia Huerta, Carolyn Jorgensen, Beverly Lazor, Renate Lichter, Maria Lopez, Pola Lopez, Rhonda Magnus, Mike Molina, Xavier Montes, Rick Ortega, Betty Saunders, Christina Ramos, Sylvia Raz, John Robertson, Mark Tovar, Doreen Villanueva, and Veronica Valadez. The show is made possible through the generosity of its sponsors which include Calavo, Clinicas del Camino Real, La Cabana, and Santa Paula Latino Town Hall. 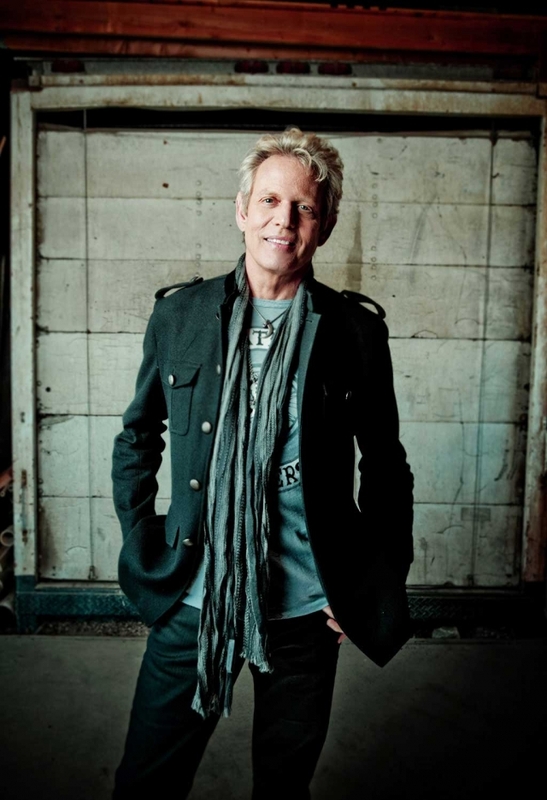 Community Memorial Healthcare Foundation and Ojai Valley Community Hospital Foundation has announced Don Felder, a former legendary guitarist with the Eagles, will be performing at this year’s “At The Bowl” benefit concert on Oct. 22 at Libbey Bowl. 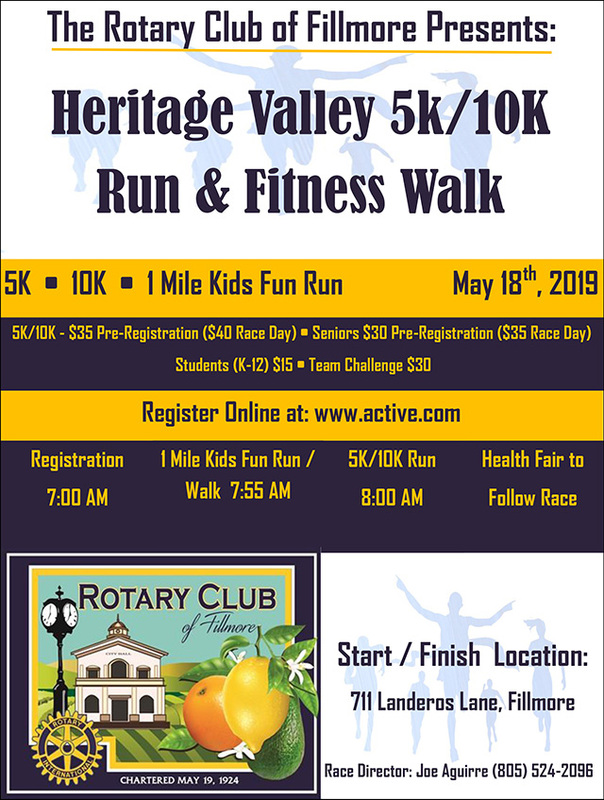 The funds raised by this event will support Community Memorial Health System construction projects – the building a new Community Memorial Hospital in Ventura and a new Continuing Care Center in Ojai. General admission tickets and sponsorship packages are available at www.cmhsatthebowl.org. Or call 805-667-2881. Community Memorial Health System is a not-for-profit health system which is comprised of Community Memorial Hospital, Ojai Valley Community Hospital, as well as the Centers for Family Health, serving various Ventura County communities. 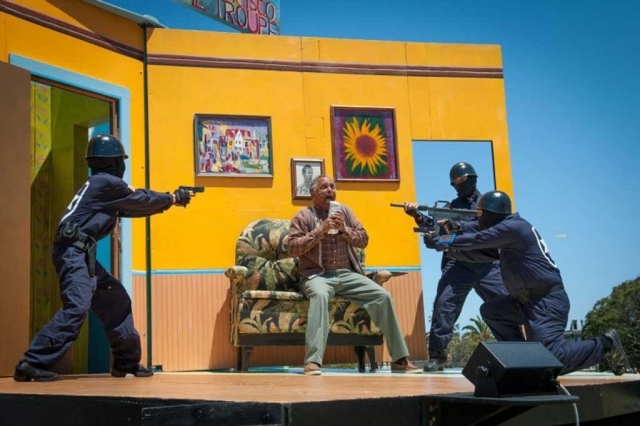 CSU Channel Islands (CI) Performing Arts students and two members of the award-winning San Francisco Mime Troupe will conduct an interactive lecture/performance satirizing the politics of 2016 along with political shenanigans from years past. The public is welcome to watch Mime Troupe members Hugo Carbajal and Lisa Hori-Garcia join upper division Performing Arts students as they present “57 Years of Political Theater” Thursday, Sept. 29 from 6 to 7 p.m. at Malibu Hall 140 on the CI campus. The title, which is derived from the political satire troupe’s 57 years in existence, encompasses a presentation of information, scenes and new material from past, present and future moments in U.S. politics. The performance marks the conclusion of an intensive visiting artist residency at CI that begins Sept. 26. 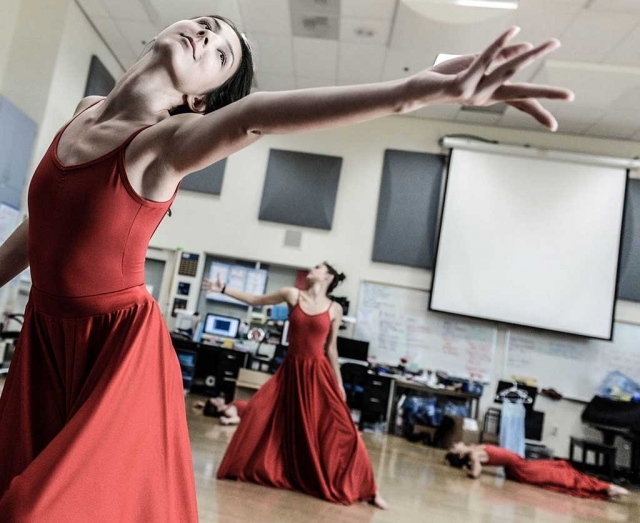 Carbajal and Hori-Garcia will give 15 hours of instruction over the course of four days to students in an upper level Performing Arts class called Acting III: Performance Styles. The Troupe incorporates a form of theater called “Commedia dell’arte,” which began in 16th century Italy and spread throughout Europe. The Troupe does not perform silent mime, but each year creates an original musical comedy that combines melodrama, farce and Commedia dell’Arte, always with a topical political theme. Burriss stressed that a solid understanding of performing arts has never been more relevant than it is in the 21st Century. Persons who, because of a special need or condition, would like to request an accommodation should contact Disability Resource Programs at 805-437-3331 or email accommodations@csuci.edu as soon as possible, but no later than seven (7) business days prior to the event, so that appropriate arrangements can be made. “Anticipation” by Beverly Lazor, oil on canvas, 12 x 16 inches, Collection of the artist. “The Right Stuff” by L.T. Bunning, charcoal and white on paper, 24 x 20 inches, Collection of the artist. 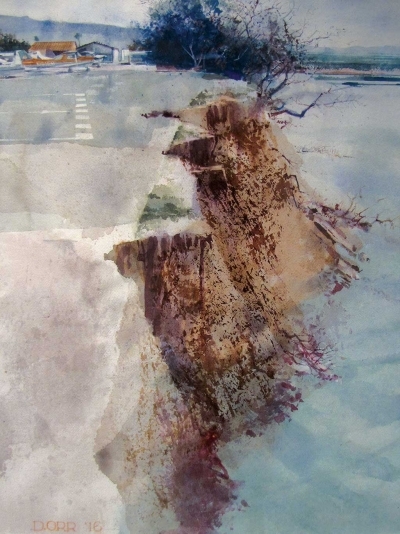 “SZP Grounded ‘05” by Dorothy Orr, watercolor on paper, 34 x 27 inches, Collection of the artist. SANTA PAULA, CA – In recent months, visitors to The Art of Aviation exhibition at the Santa Paula Art Museum have been invited to cast their votes for their choice of best artwork. The aviation-themed exhibition features art by over 30 artists working in a variety of media. Hundreds of ballots were tallied, and the Museum is thrilled to announce the People’s Choice Award winners. First place was awarded to Santa Paula artist Dorothy Orr and her stormy watercolor entitled “SZP Grounded ’05.” Camarillo artist L.T. 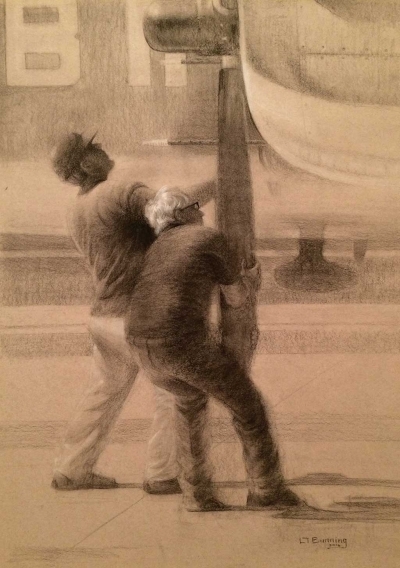 Bunning was honored with second place for her charcoal drawing entitled “The Right Stuff.” Tied for third place were Los Angeles County artists Sergio Hernandez and Beverly Lazor for their oil paintings entitled “Low Pass” and “Anticipation,” respectively. The Art of Aviation is a group art show produced in partnership between the Santa Paula Art Museum and the Aviation Museum of Santa Paula. The exhibit is a tribute to Santa Paula and Ventura County’s historic and contemporary aviation culture. 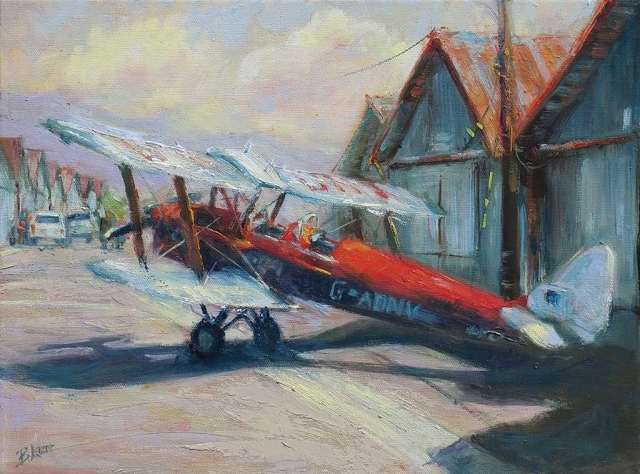 Many of the artworks on display were painted on location at the famous Santa Paula Airport, established in 1930. Visitors can view all of the winning works and many more now through October 16, 2016, at the Santa Paula Art Museum. The Santa Paula Art Museum is located at 117 North Tenth Street in downtown Santa Paula. The Museum’s regular hours are Wednesday through Saturday from 10:00 a.m. to 4:00 p.m., and Sundays from 12:00 to 4:00 p.m. Regular admission is $4.00 for adults, $3.00 for seniors, and is free for museum members and students. For more information, please contact the Museum at (805) 525-5554 or info@santapaulaartmuseum.org. Beginning at 11 a.m. on Saturday, October 8, 2016, the Ojai Library will be participating in Indie Author Day. This special day is centered around indie writing and publishing, and includes author panels, book readings, workshops, and information on how to get your self-published eBook into the library catalog. The Ojai Library will be one of many libraries across North America delivering Indie Author Day events. These events are designed to bring local writing communities together. At 11 a.m. PST, everyone will have a chance to join a digital gathering featuring a Q&A with writers, agents, and industry leaders. Then, from 12 to 3 p.m. the library will host presentations by individual authors, and at 3 p.m. there will be a panel discussion. 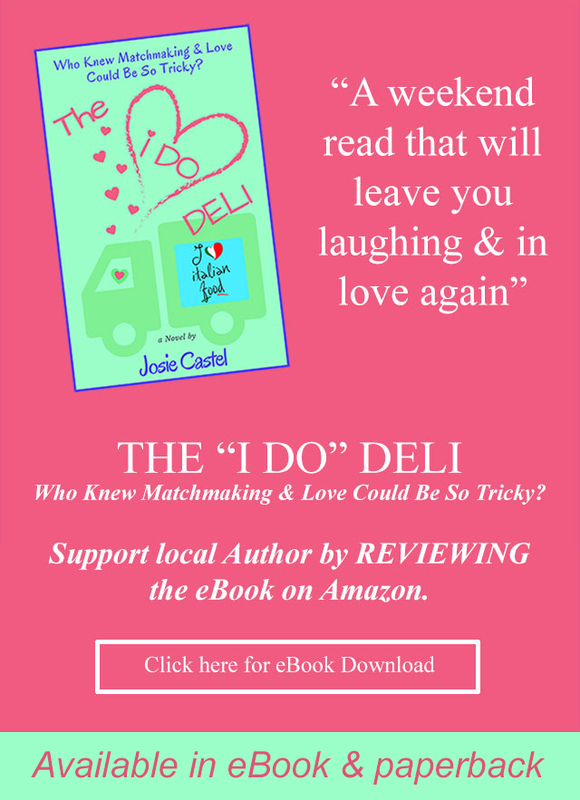 Visit indieauthorday.com for more information! All events for the day are free and open to the public. 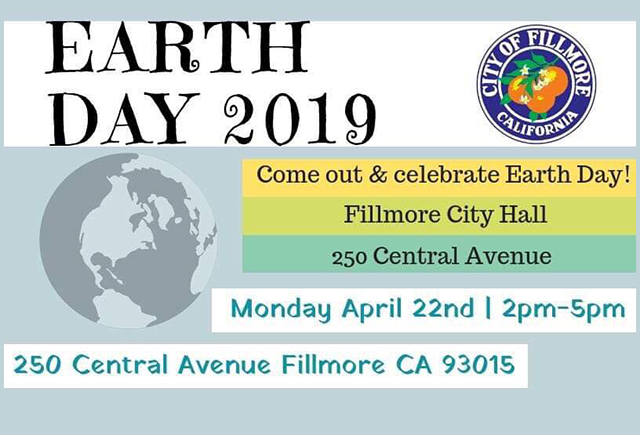 For additional information or event schedule inquiries, contact Ron Solórzano, City Librarian, at (805) 218-9146. 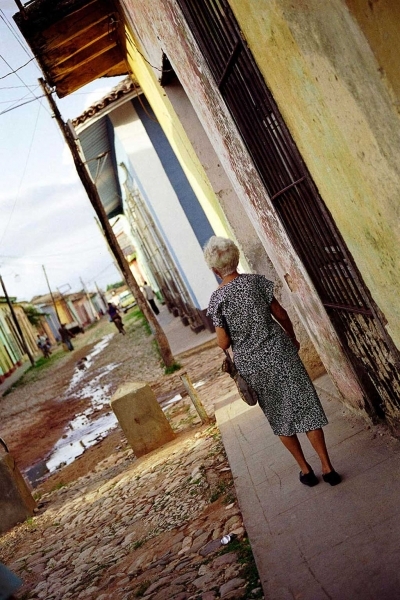 Cambianica discovered a passion for photography in 1998 upon retiring from her career as a successful restaurateur. She has been education chair for the Ojai Photography Club for the past 16 years, identifying judges and presenters for the monthly meetings, as well as mentoring new photographers in the club. Her images have won numerous awards and eight will be installed permanently at Ventura Community Memorial Hospital. 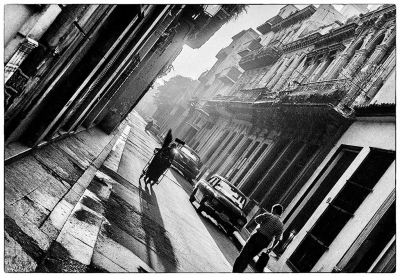 "My Angle on Cuba" will be on view through October 31. The Coffee Connection, serving organically grown fair trade coffee, is located at 311 E El Roblar in Meiners Oaks, open 5 a.m. - 5 p.m. Monday through Friday, and 6 a.m. - 1 p.m. Saturday and Sunday. The Ojai Photography Club welcomes the return of Ojai based photographer and guerrilla writer Dean Zatkowsky as the September presenter. The meeting will begin at 7:00 p.m. on Tuesday, September 20, at Help of Ojai’s Kent Hall, 111 Santa Ana Street, Ojai, CA. For more of his know-how and humor, go to his photography blogs: https://cameraclubconfidential.com and http://dizzyone.net/nobadlight/. 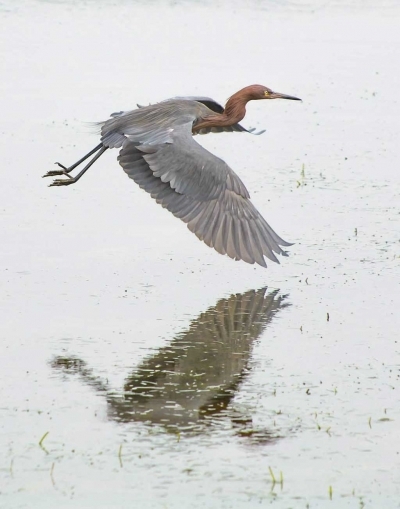 For a gallery display of his selected wildlife images, drop by OVA Arts, 108 North Signal St., Ojai. Monthly free presentations are part of the Ojai Photography Club’s community service and education outreach. Visitors are always welcome to attend. On Saturday October 8th at 7pm, at the Ojai Valley Grange, the Ojai-based production company On The Water Front Creative presents a big wave surf film night featuring the multi-award-winning documentary film, One Winter Story. Afterwards, film’s star, big wave surf pioneers Sarah Gerhardt, and Frosty Hesson, who’s mentorship of a young big wave surfer was depicted in the Hollywood film Chasing Maverick’s, along with OWS filmmaker Elizabeth Pepin Silva, will be on hand to answer questions and talk about their lives and big wave surfing. 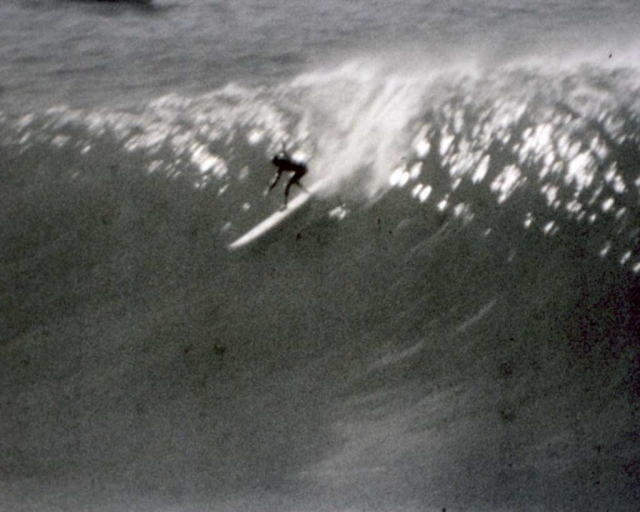 This is a rare chance for the audience to meet these two surf legends in person. One Winter Story is an unprecedented glimpse into the male-dominated world of big-wave surfing from an unusual and seldom seen perspective - a woman’s. This hour-long documentary, experimentally shot on film, explores the life of big-wave surf pioneer and Ph.D scientist, Sarah Gerhardt, a relative unknown who made surfing history in 1999 as the first woman to surf Maverick’s, the giant wave in Northern California. Using a montage of film and voice, One Winter Story traces Sarah’s dramatic journey from poverty and despair to faith and forgiveness as she struggles to find her place both in the line up, and in the world. The film has screened internationally and has won multiple film festival awards including grand prize at Europe’s largest surf film festival in France, and the Jury Selection Award at the Santander Sports Film Festival in Spain. Come join us for a fun night of California big wave sufing. 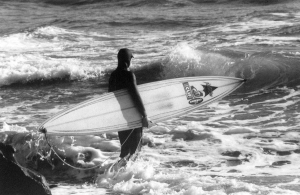 As with all our surf film nights, part of the ticket sales benefits a local Ojai non-profit. Peace Pod with Ojai Sign: Anahata Pomeroy, Julie Heyman, Lisa Berman, Kathy Nolan, Brian Berman, Dianne McCourtney, not present in photo Ray Powers and Sylvie Lee. Photo by David Baker. 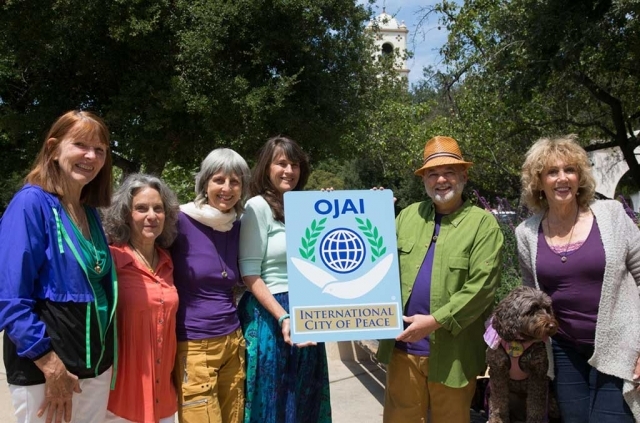 Ojai’s Peace Day 2015. Photo by Rakesh Menon. Ojai International City of Peace will host the UN International Day of Peace at three successive venues in Ojai on Wednesday, September 21st. 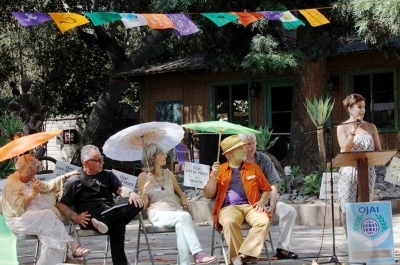 Ojai's Day of Peace is an event for all ages. The full day of celebration begins with the Sounding of the Bell Chant and Meditation, from 7:15 am- 8:15 am at the Porch Gallery (310 E. Matilija St., Ojai). From 9 am to 4 pm activities move to the Ojai Art Center (113 S. Montgomery Street, Ojai ), beginning with a Chumash blessing by Julie Tumamait-Stenslie, followed by peace building presentations, music, reflection, audience participation, and the announcement of this year’s Ojai Noble Peace Prize recipient. Some of the day’s presenters include Khaled Alawar, David Baker, Evan Austin, Kathy Nolan, Alan Chang, Andy Gilman, Vina Lustado, Marilyn Miller, Dmitri Corbin, Akka B, and Nuri Ronaghy. 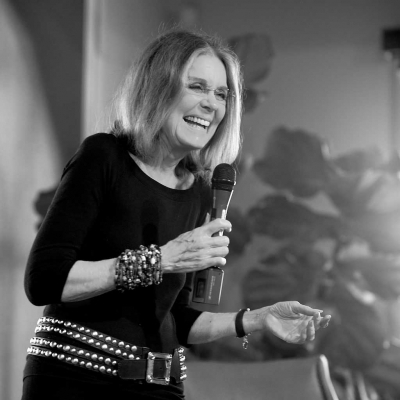 From 12 noon-2pm, at the Ojai Art Center, there's a Bring Your Own Brown Bag Lunch and presentations from a Panel of Peacemakers: 9 local citizens sharing how they ‘keep the peace’ within themselves as they face the challenges in their area of work: Arts, Business, Community, Communication, Education, Environment, Governance, Health, and Spirituality. Concluding the day's events, from 7:30pm-9:00pm is a Concert for Peace at Meditation Mount (10340 Reeves Rd., Ojai ) an evening of evocative music, heartfelt songs and potent imagery celebrating the unity of all humankind, featuring Ray Powers, Alarra Saress, Andro Kotula, (a suggested donation of $20.00). International Day of Peace began in 1981 as an annual day of cease-fire and non-violence. 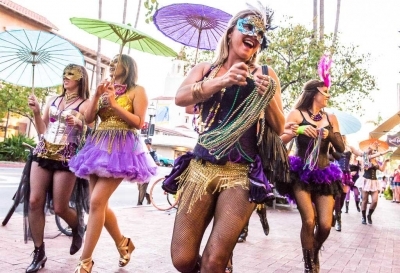 Thousands of events are held all over the world on this day, and this is the second year Ojai International City of Peace, so designated by an Ojai City Council Proclamation in April of 2015, is sponsoring the full day’s events. Ojai is one of 139 Cities of Peace world-wide. 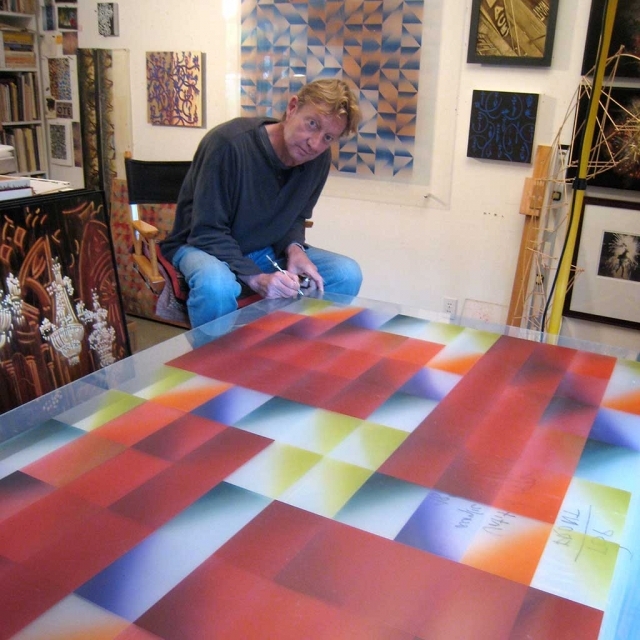 Artist studios throughout the breathtaking Ojai Valley will be open each day from 10am to 5pm. Artist demonstrations proved so popular last year, they’ll be expanded in 2016 with the Demonstration Schedule distributed in advance. 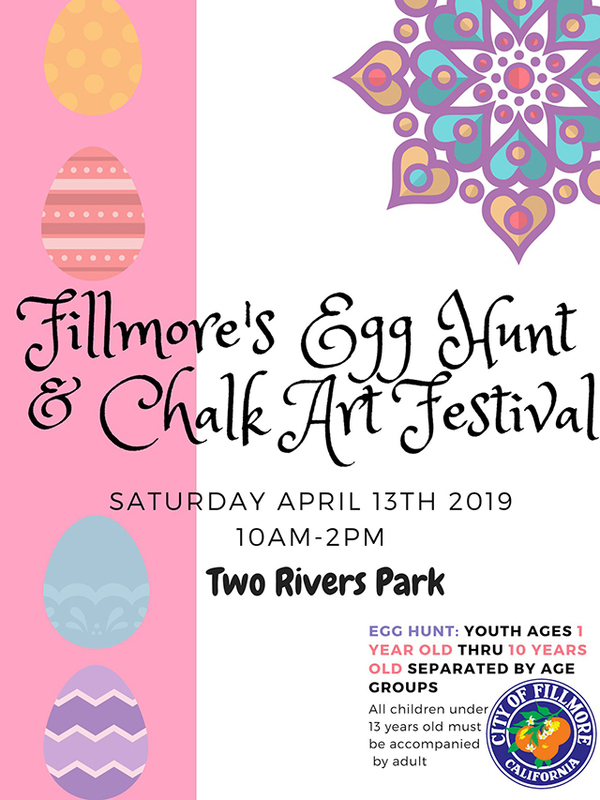 Among the demonstrations are drawing with an Ipad, plein air and encaustic painting, pot throwing on the wheel, live portraiture in pastel and ink and a public painting project. For those who would like to make art as well as see art, a brand new selection of specialized pre-Tour workshops will be offered on Friday, October 7th. They are Eco-Dying with Ojai Plants, taught by fiber artist Carol Shaw-Sutton, a class in 3D Printing, taught by sculptor Brian Berman and Silverpoint Drawing, taught by painter/printmakers, Linda Taylor and Katie Van Horne. Registration and fee details are online at ojaistudioartists.org. A free Tour ticket is included in the workshop registration for both the drawing and 3D printing classes. The eco-dying course includes three silk scarves and lunch at the artist's studio. Another pre-Tour highlight is the free introduction to OSA artists offered at 7pm on Friday, October 7th at the Ojai Art Center. Ceramics/glass artist Richard Flores will introduce a new video he has produced featuring the Tour artists and their work. The video is designed to help people plan their personal Tour schedules and will be available to view throughout the Tour. Tour-goers are all invited to join OSA Tour artists at Saturday’s "Pink Moment" Reception, open (free) to all ticket-holders. The event features a raffle of beautiful baskets filled with original art and fine local products, such as Ojai honey, olive oil and lavender. Proceeds from the Tour and Art Basket Raffle fund OSA’s “Artreach Program” of youth art scholarships and funding for community arts needs. Tour tickets are $30 in advance and cover studio visits all three days and admission to Saturday’s Dessert Reception. Tickets and Tour brochures are available at ojaistudioartists.org, and on Tour days at the Art Center. Center for the Arts, 113 S. Montgomery Avenue. Advance Tickets: $30 adults, $15 for youth 16 and older; youth 15 and under free. $20/person for arranged groups of 10 or more. Ojai Studio Artists mission:. . . to create an environment where artists thrive ― professional and student alike — and fulfill the potential of the arts to enrich lives and build community. The Ojai Studio Artists (OSA) are an approved 501 (c)(3)nonprofit. 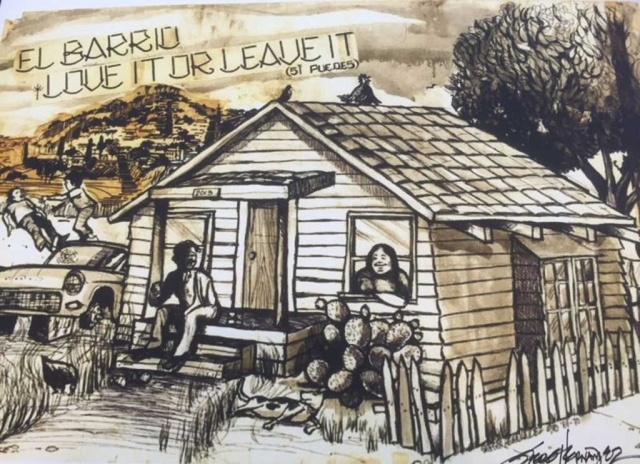 School segregation, the civil rights movement and the Vietnam War were topics pulsing through Los Angeles barrios in the 1960s, but the Latino voices in the area went largely unheard and unpublished. The exhibit is up through Oct. 7 at the CSU Channel Islands (CI) John Spoor Broome Library with a reception at the gallery on Tuesday, Sept. 6 from 5:30 to 7 p.m.
Barrio artists and writers found their voices on the pages of Con Safos, including cartoonist Sergio Hernandez, who was 19 when Gomez persuaded him to join the group working on the magazine. 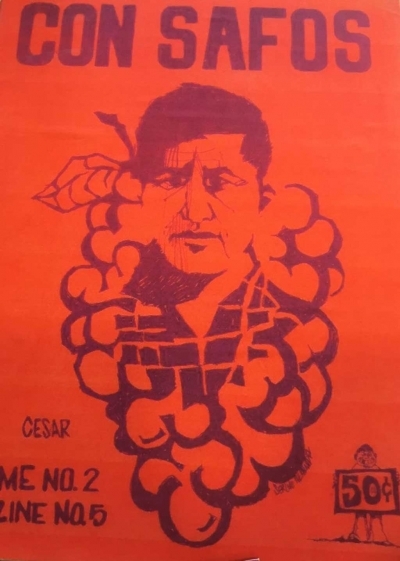 The magazine contained current events, but also provided a public venue for cultural icons such as Chicano artistic pioneer Gilbert “Magu” Lujan, who worked as one of the art directors at Con Safos. The exhibit opening reception on Sept. 6 will include a talk from curator Denise Lugo, an Art Lecturer at CI and former director of the Latino Museum and History, Art and Culture in Los Angeles. She created the exhibit with help from CI Assistant Professor of Spanish Margarita López López, Ph.D., who served as the Exhibition Sociolinguist. “After 46 years, the importance of that time of the Chicano Movement in Los Angeles lies in the courage and commitment of young Chicanas and Chicanos, like newsperson Rubén Salazar, who dedicated their lives to issues of social justice and respect for the Chicana/o Latina/o and Spanish-speaking communities,” López López said. Salazar worked for the Los Angeles Times in the 1960s, becoming the first Mexican-American journalist from mainstream media to cover the Chicana/o community. 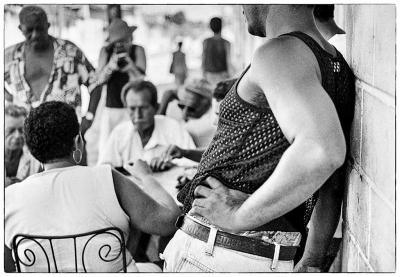 Lugo said “Con Safos” was as significant to Latinos in the 1960s as the Harlem Renaissance was to African Americans in New York City. 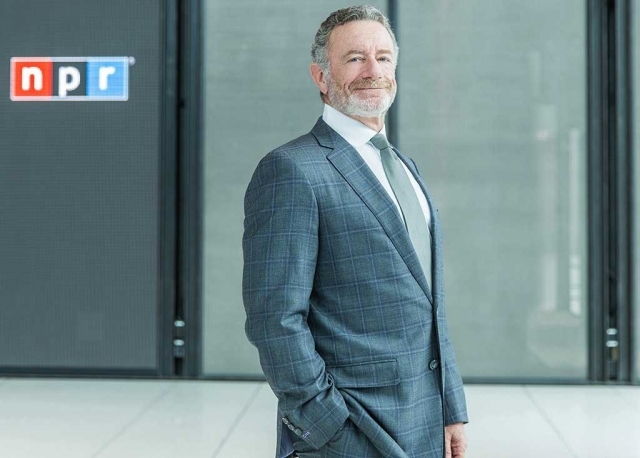 Jarl Mohn, President and CEO of National Public Radio. The president and CEO of National Public Radio will speak at California Lutheran University on Friday, Sept. 16. Jarl Mohn, who took the helm of Washington, D.C.-based NPR two years ago, will speak at 7 p.m. in Samuelson Chapel on the Thousand Oaks campus in an event presented by KCLU Radio, a community service of Cal Lutheran. He will discuss the news business and the future of NPR. Mohn oversees the nonprofit multimedia organization’s strategy to create a more informed public by working with member stations across the country including KCLU. Nearly 1,000 member stations serve about 30 million weekly listeners. In his career, Mohn has helped a variety of media businesses on different platforms respond to rapid changes in audience trends. He created E! Entertainment Television and served as its president and CEO from January 1990 to December 1998. From 1986 to 1990, he was executive vice president and general manager of MTV and VH1, where he introduced the long-form programming strategy at the heart of the networks today and diversified audiences by developing innovative programming around alternative music formats. He was also the founding president and CEO of Liberty Digital, a public company that invested in cable networks, the internet and online businesses. Mohn spent almost 20 years in radio, many of them as a disc jockey at stations including WNBC in New York. In addition to his on-air work in radio, he served as a programmer, general manager and owner of a group of radio stations. Prior to joining NPR in 2014, Mohn served on the board of trustees of Southern California Public Radio for more than a decade, including two years as chairman. He spent over 12 years on the board of the University of Southern California Annenberg School for Communication and Journalism, including six years as its chair. He has also been a corporate director and adviser to a number of media companies, making direct early-stage angel and seed investments in digital media/technology ventures. Since 2008, he has served on the board of Scripps Networks Interactive. He and his wife, Pamela, created The Mohn Family Foundation in 2000. The Santa Monica-based nonprofit has donated to public radio stations, children’s charities, human rights advocacy groups, healthcare organizations and art museums. Tickets are $20. To purchase, call KCLU at 805-493-3900.